The frame "Pressure determination" allows to input the depth of the slip surface and load on the anti-slide pile above the slip surface. If the standard selection "Calculate" is checked, the load is specified by active horizontal force and passive horizontal force that acts on the pile above the input slip surface. Active and passive forces can be calculated in the "Slope stability" program and transferred into the program "Anti-Slide Pile". Next, the shape of the pressure distribution must be specified behind (active force) and in front of the pile (passive force). Program does NOT INCREASE the input passive and active force by any partial factor during the analysis - it is necessary to determine them according to required standards and rules. 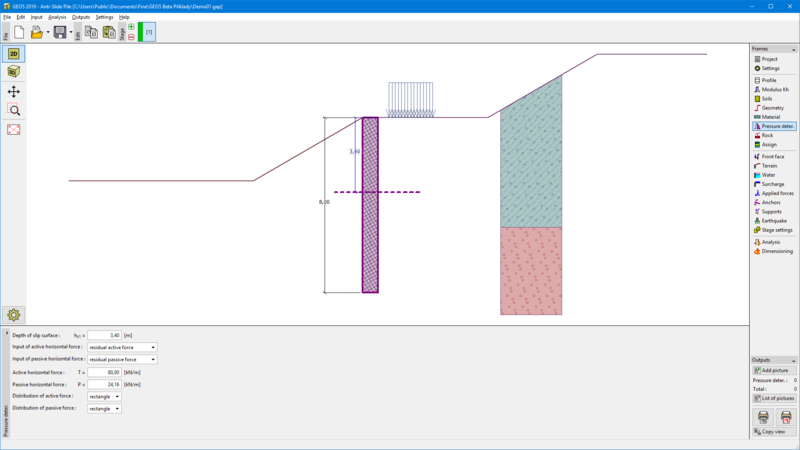 If the forces are obtained from the Slope stability program, they correspond with the way of analysis set in the program. For example, when analysis is done according to Eurocode EN 1997-1, the received values are already design values of forces. The values of the resulting pressure acting on the structure above the slip surface can be input in the table (option "Input") too.